This Version are an Update of rFactor Config PRO 3. 6- Engine Motors 2 Beta, is a simple editor text configured for rfactor engine. E-Desk09 will update Engine Motors 2 in the future update. 3- Multiplayer Center, you can save your favorite server name, your friends username. can you post a new download link please? There is a problem with Update System, last version are 1.0.0.2, the software, download the file from internet,but doesn't update the core. It was developed only for those who want to enjoy running more with their cars. in the new version, the modified mods will be saved in the program folder, and can be restored whenever you want to play online, which means that the original files are always present! In final version, this serials is not valid!! does this software change engine settings for mods and if so would this give mismatches online in servers and leagues! The other thing is that if you can change engine power and other things in the files then wouldnt this be a cheat! I dont wont software like this if you change files or manipulate the mods engines and physics! 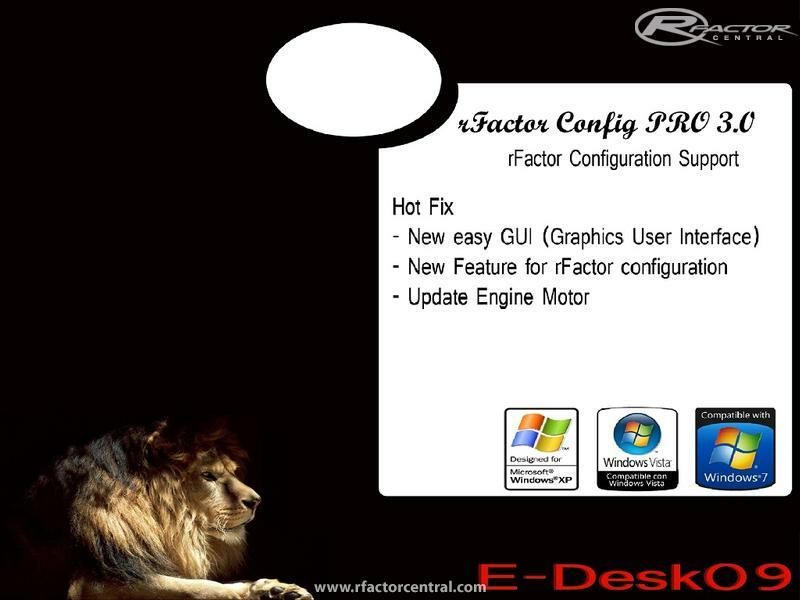 rFactor Config pro 3 is under costruction! can leave comments on things that are dysfunctional and should be changed? perhaps, the S.O is doesn't supported,but it seems very strange. I recompile the programm, and i post the link of path download 1.0.1.